As his band broke into the evening’s first number, you could hear Paul Anka singing but did not know where he was. 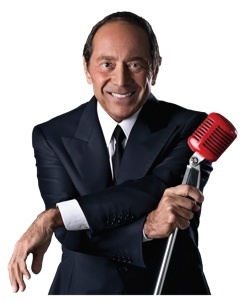 It wasn’t until a spotlight was flashed into the rear of the Seneca Niagara Events Center that one could see Anka walk down the aisle up towards the stage as he crooned “Diana.” It was the song that made it all happen for Anka as it shot up to number one in 1957. It was during “Times Of Your Life” where a video screen came down center stage and with Anka in several pictures. Anka was in several photos with many famous people and was also shown in clips depicting his long career including family and some of his most cherished photos. He had mentioned how he had five daughters and seven grandchildren as he introduced his most recent number one tune “(You’re) Having My Baby” from 1974. Anka has had quite an illustrious career as a singer, composer and actor. At 72, he has not lot any of his voice, wit and personality that helped make him who he is today. He has hit the top of the charts three times, numerous top tens and appeared in several film s and television shows. Anka is a must see artist for any fan of music who appreciates quality music performed in a top notch manner.